The Crustacea is the largest group of marine arthropods, earning it the title 'insects of the sea'. Being arthropods, crustaceans have a tough, chitinous, segmented ex-oskeleton, but are distinguished from other arthropods by having two pairs of antennae at some stage in their life cycle (antennae are lost in adult barnacles). Crustaceans are primarily marine species, but also occur in many terrestrial and freshwater habitats. They range in size from microscopic copepods to the Japanese giant spider crab (Macrocheira) with a 4 m leg span. The best-known crustaceans are the crabs, shrimps and lobsters for their large size and culinary qualities. The crustacean body generally comprises three regions: the cephalon, thorax and abdomen (or pleon). Each region usually bears paired biramous limbs. The cephalon bears the compound eyes and two pairs of antennae. The limbs of the thorax form the mouthparts, grasping and locomotory legs; and those of the abdomen typically form pleopods (swimmerets) and uro-pods. Many crustaceans breathe through gills located either at the base of the thoracic limbs (e.g. decapods) or abdominal limbs (e.g. stomatopods). Crustaceans continue to grow throughout their lives, unlike insects, which stop growing at maturity. The hard exoskeleton, however, cannot stretch or expand to accommodate growth. To increase in size crustaceans must periodically shed their old exoskeleton in a process known as moulting or ecdysis. In the lead-up to a moult, calcium and various other minerals are resorbed into the body from the old exoskeleton, beneath which a new, soft skin develops. The old exoskeleton 'loosens' at key locations and fractures along various defined points (called moult sutures). The animal extracts itself from the old exoskeleton, often within only a few minutes. Recently moulted animals, being soft and extremely vulnerable to predation, hide and remain inactive. At this time, calcium and other minerals from the old exoskeleton and surrounding seawater are slowly redeposited in the new soft exoskeleton. Within 24 to 48 hours, the new exoskeleton hardens and the animal can resume normal activity. Sexes are usually separate in crustaceans and most have planktonic larvae. Planktonic larvae pass through many stages and can spend months in the plankton before settling on the bottom. Crustacean larvae are a significant component of the zooplankton. On the GBR, crustaceans are abundant in all habitats, with around 1300 species recorded. 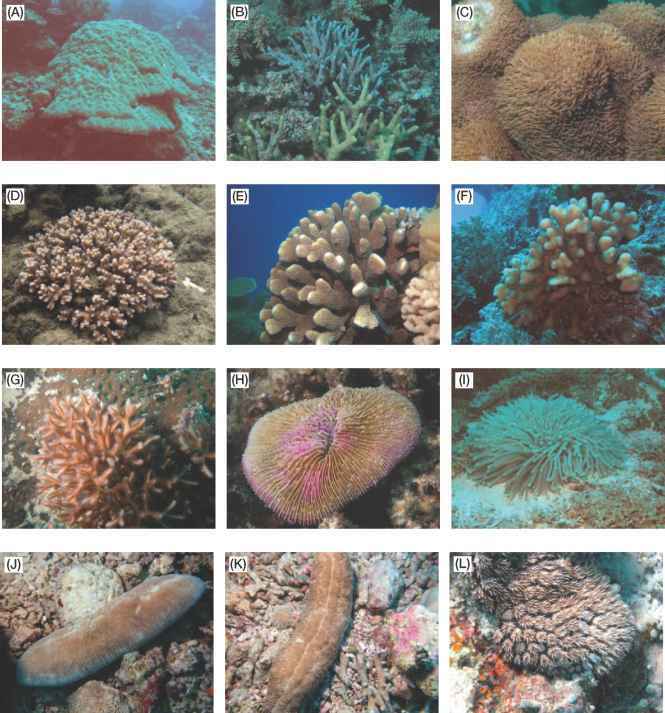 In general, back-reef sites on mid-shelf reefs have the highest overall crustacean diversity, but most habitats await detailed faunal study. The most conspicuous crustaceans are the comparatively large and usually colourful decapods (crabs, shrimps, lobsters) and stomatopods (mantis shrimps), but small-bodied, speciose groups such as peracarids, ostracods and copepods, are also common. The major crustacean groups to be encountered are discussed below.